San Diego city planners are walking back plans to let developers build taller buildings near a new transit station at Tecolote Drive. Residents have fiercely opposed plans to allow more housing along the new Mid-Coast Trolley corridor. They’ve now twice won concessions from the city. For a second time, San Diego city planners are walking back plans to let developers build taller buildings near new stations along the $2.1 billion Mid-Coast Trolley line. Planning Director Mike Hansen issued a memo Monday, obtained by Voice of San Diego, announcing city staff won’t propose increasing the height limit near the new transit station at Tecolote Drive. The city had planned to increase the height limit from 45 feet to 100 feet, as part of the Morena Boulevard Specific Plan the City Council is expected to vote on early next year. Hansen also supported a community request to include building a pedestrian bridge over I-5. And the city will drop its idea of making Morena Boulevard more bike- and pedestrian-friendly by eliminating one lane of car travel and some parking in favor of a protected, two-way bike lane between two new trolley stations. It will instead remain a four-lane road, with two lanes in both directions, though Hansen said planners will see if it’s possible to build the bikeway while maintaining all four lanes. “We share your goal of improving the neighborhoods of Bay Park and Morena and welcome feedback on how the plan can best accomplish that,” Hansen wrote to Councilwoman Lorie Zapf, who represents the area. San Diego has committed itself to cutting its carbon footprint in half by 2035, in part by getting more people to live in dense housing near jobs and transit. But it has backed down from opportunities to help achieve that goal, in the face of local opposition. There has been fierce opposition to the city’s plan to increase housing along the region’s largest-ever public transit investment. The Mid-Coast Trolley is expected to begin service in 2021. Residents have staged protests and strident town halls demanding the city abandon plans to allow more housing along the corridor. They’ve now twice won concessions from the city. Four years ago, city planners considered increasing the height limit and housing density near the station planned for Clairemont Drive. After vocal opposition from residents, the city said it would not propose any changes near that station as part of its plan, but it continued to seek more housing near the Tecolote Drive station. But the city hasn’t entirely abandoned its ideas: Hansen’s memo said the city will still make zoning changes near the Tecolote station that will let developers build more homes there. But they’ll need to comply with the current height limit, which could make it difficult or impossible to deliver those increases. “We feel comfortable that the densities proposed are still achievable with the existing height limit,” Hansen said. Projects might have less flexibility in design, more uniform architecture or less open space, he said, but planners are hopeful developers could still build as many homes. Both four years ago and now, Zapf was running for re-election just as the city publicized its proposals. In both instances, Zapf pressured the city to change its plans. Last month, she wrote the community a letter saying she opposed the city’s proposal and asking residents to voice their displeasure with it. She likewise asked the city’s planning director in 2014 to abandon changes. He did. Zapf convincingly won re-election in 2014 despite outrage over the plan. She’s now running against Jen Campbell, a Democrat who also opposes any attempt to increase the height limit in the area. “We always strive to get the support of the Council member and the community planning group in a proposed area, and we routinely make changes to get that,” Hansen said. Dave Potter, a former city planner who now sits on a community group focused on the Morena plan, said it’s good the city listened to the community’s requests. Potter acknowledged that density regulations are still being increased, but said “they’d have to be really small apartments” to make it work. But the discussion is not necessarily over, despite the city’s new approach. The city included the more aggressive changes to development regulations in its environmental review of the plan. That means the City Council could still choose to adopt those more aggressive changes, even though city staff is no longer recommending them. “It’s now up to the City Council to do the right thing and show their leadership on the city’s goals for Vision Zero and the Climate Action Plan,” said Maya Rosas, director of policy for the mobility advocacy group Circulate San Diego, and president of the pro-housing YIMBY Democrats of San Diego County. Vision Zero is the city’s goal of ending traffic-related fatalities by 2025, which calls for improved bike and pedestrian facilities and calming traffic to slow vehicle speeds traffic speeds. And in its Climate Action Plan, the city set a target of having half of all city residents bike, walk or take transit to work by 2035. Potter, likewise, said the final decision now rests with the Council. “The City Council could do what they want – it’s something the community will have to watch out for,” he said. Developer Perry Dealy is pursuing a project of some 1,700 homes near the Tecolote Drive station, on property currently occupied by Jerome’s Furniture and a vacant Toys R Us. He’s envisioned building to 90 feet tall and hoped the increased height limit would be included in the city’s plan. He did not respond to a request for comment on the city’s decision. 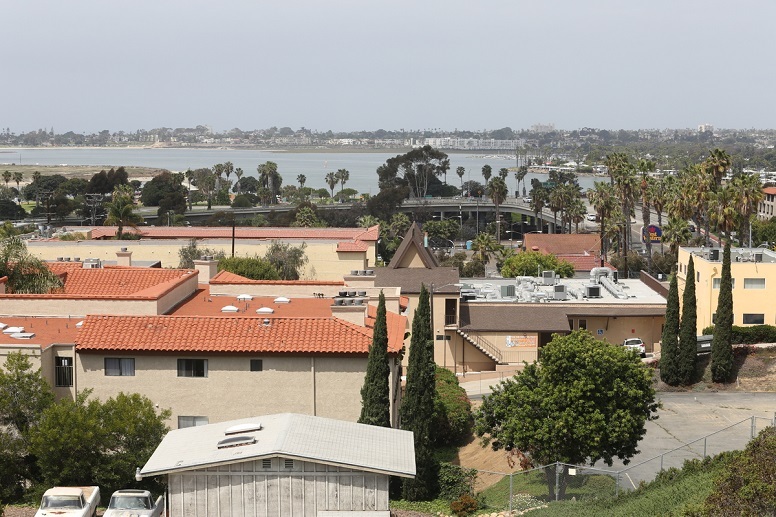 Failing to build as many homes as possible along the Morena Boulevard corridor is a missed opportunity for the entire region, said Bruce Appleyard, a professor of urban planning at SDSU. Appleyard has developed what he calls a Smart Growth Calculator – it uses data from the Environmental Protection Agency and the Housing and Urban Development Department to determine the average pounds of carbon emissions per household within specific areas. Households near the existing trolley station in Linda Vista – near multiple employment centers and regional destinations, and with a temperate coastal climate – emit an average of 10,000 fewer pounds of carbon per year than households built in undeveloped portions of San Diego County, according to Appleyard’s analysis. “That means that 10,000 urban fringe units will emit about 100 million more pounds of carbon a year than if they were allowed to be built in transit-accessible locations like the Morena corridor,” Appleyard wrote in an email. Even just moving from a community like Bay Park that doesn’t have high-frequency transit access to one that does (like when the Mid-Coast begins service) reduces the average carbon emissions per household by 6,000 pounds per year. But there’s a fundamental equity issue the city must confront too, he argued. When development is restricted from areas like Bay Park, it increases development pressure on lower-income or minority communities that have less political power to push back.